Coleslaw is a crunchy, raw salad made from a range of julienned vegetables usually coated in a sauce - often mayonnaise - and a drizzle of vinegar. Ideally, the sauce should only give a light coating to the vegetables, as the idea is to let the flavours of the vegetables stand out as much as possible. Add the red onion, carrot, mayonnaise and vinegar and stir to combine. Not all coleslaws need to be drenched in mayonnaise – Shaun Hill and Martin Wishart both create Asian-inspired coleslaws where the vegetables are tossed in a light dressing: lime juice, sesame oil, soy sauce and honey and rice wine vinegar and soy sauce, respectively. For an alternative to mayonnaise, try using crème fraîche for a lighter, slightly sourer flavour. The ingredients used can be determined by the season: celeriac and apple are often added to a wintery coleslaw, while summer varieties may include wild garlic, asparagus and fennel. 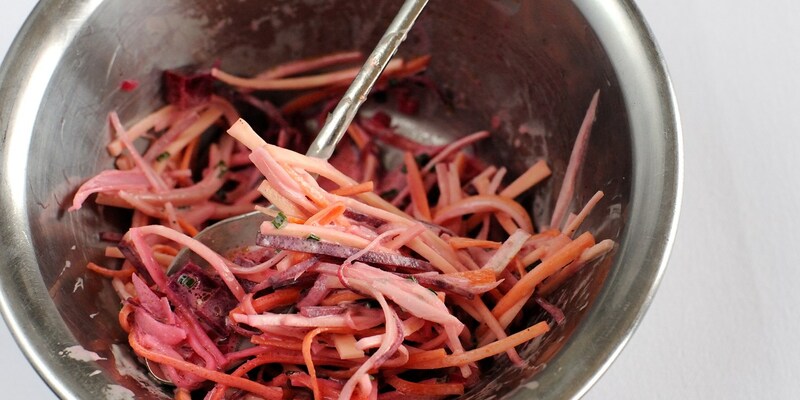 Anna Hansen’s winter slaw combines kohlrabi, fennel and golden beetroot while Paul Ainsworth adds fennel and celeriac.